Download The Secret Life of Pets in Digital HD from the iTunes store. 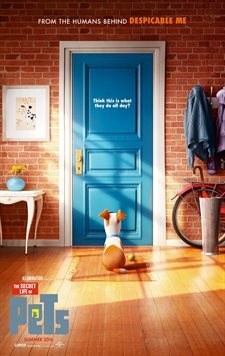 The Secret Life of Pets images are © Universal Pictures. All Rights Reserved. Illumination Entertainment hasn't made a ton of animated films, but, when they do, they typically get it right. Great characters, good stories, terrific animation, etc. Their feature films are something to look forward to and their characters tend to be memorable (Minions anyone?). Their newest foray into the world of animation, The Secret Life of Pets, follows this tradition as a fun filled movie that kids of all ages and pet lovers can enjoy. Max (Louis C.K. ; The Chris Rock Show) has a great life. His owner Katie (Ellie Kemper; Unbreakable Kimmy Schmidt) loves him, he has a great apartment to live in in New York, and lots of pet friends to play with. It doesn't get any better, right? Unfortunately, one day Katie brings home a big furry Dog named Duke (Eric Stonestreet; Modern Family) and let's just say Max is less than pleased. The two dogs aren't keen on sharing a space and Katie's affections and try to get rid of one another until they get lost while playing in the park and caught by Animal Control. Luckily (or maybe unluckily), they are rescued by a group of vigilante former pets lead by a mean bunny named Snowball (Kevin Hart; Ride Along) and end up in the sewers. However, when the sewer animals find out they aren't who they claim to be, Max and Duke have to run for their lives and end up far from home. Finally found by their friends, they all manage to get back home and bask in the enjoyment of their owners' love after embarking on an adventure. There are so many things right with this movie it's hard to know where to begin. While the story isn't anything unique (frankly I was reminded of Andy and Woody from Toy Story trying to get back to Andy after getting lost), it is fun none the less. The dialog wasn't cheesy or lame and I wonder how much of it - especially Kevin Hart's lines were improvised. There were a few references clearly for the adults in the audience only, but that is nothing new for an animated film. The cast is fantastic, with the aforementioned Hart stealing many of his scenes. He takes the cute, fluffy bunny named snowball and transforms him into what one would imagine is a foul mouthed (had it not been a PG rated film), streetwise punk of a rabbit. With a blend of new and old comedians voicing these adorable characters, there is a cohesive collective of humor that emanates off the screen. The animation is very well done and the colors popping off the screen are vibrant and enticing, especially to the intended audience of small children. The humor is laugh out loud funny and even the scarier moments are tame and almost lighthearted and broken up by small jokes. The soundtrack also lends an air of fun and frivolity to the film. With various genres all represented there is a little something for everyone. 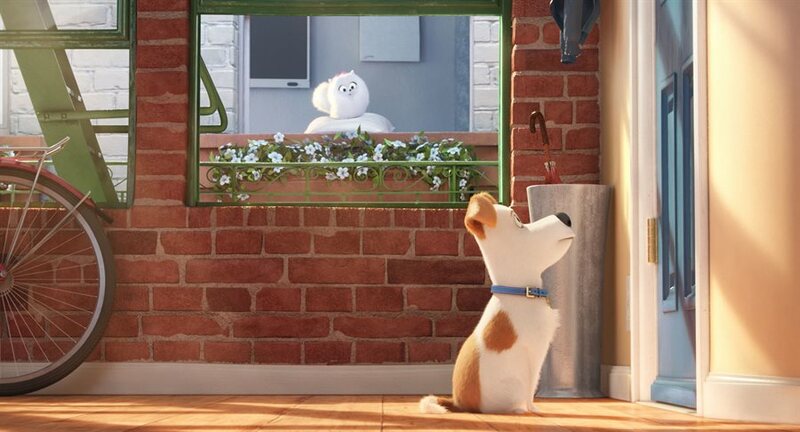 In a summer of sequels and lack luster movies, The Secret Life of Pets is a stand out in the crowd and once again reminds us why Illumination Entertainment is a force to be reckoned with in the world of animation. Cute characters (ripe for merchandising opportunities) plus well done artwork equals a summer blockbuster and The Secret Life of Pets hits the mark perfectly. The Secret Life of Pets images © Universal Pictures. All Rights Reserved. Not a bad movie, was watchable. I'm going to love this movie!! !